The origins of hyuganatsu is said to be rather “mysterious” as it purportedly appeared out of nowhere as a sapling almost 200 years ago in Miyazaki back in 1820. 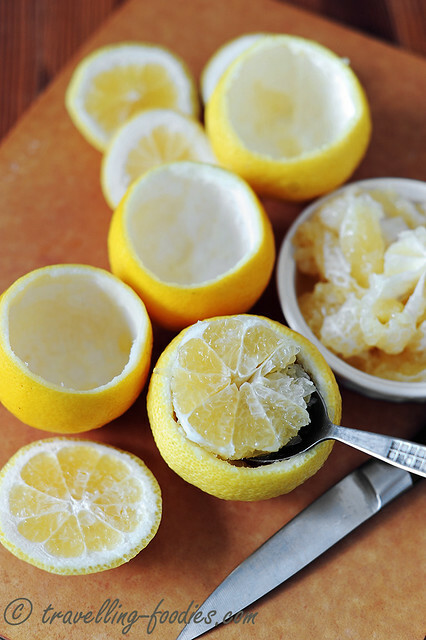 Though it has been scientifically described as a taxonomically distinct species, many have thought it to be a natural hybrid between a yuzu and a pomelo. The former lends the hyuganatsu its aroma and acridity which this fruit is most known for, while the thick pith and shape makes it look like a downsized pomelo. 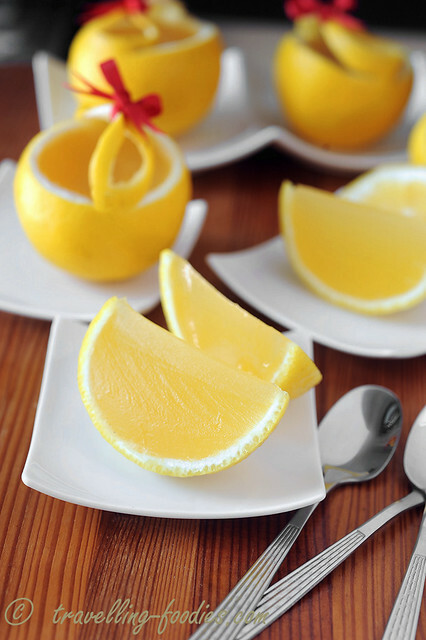 Speaking of the pith, it is worth noting that much of it is eaten and enjoyed together with the pulp flesh as the former does not have the astringent and somewhat bitter aftertaste which many other citrus varieties have. Cut off 1/8 of the top of each hyuganatsu fruit. Set aside the cut peel pieces as “lids” for later use. Using a paring knife, carefully make a cylindrical cut around the pulp of each fruit, being careful not to cut through the peel. Using a spoon, gorge the pulp of each fruit carefully, leaving the pith largely intact. 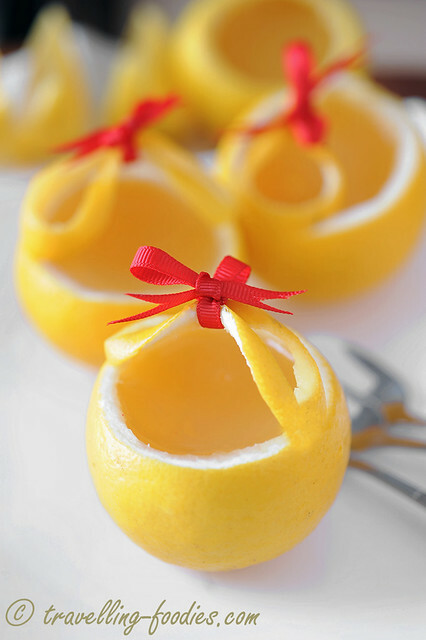 Set aside the emptied hyuganatsu peel “cups” for later use. Squeeze out as much juice as possible from the gorged out pulp. It should yield around 300-400g of hyuganatsu juice. Transfer the juice into a mixing bowl and top up with water until the total mass is 500g. Add sugar into the diluted juice and stir thoroughly to dissolve as much of the sugar as possible. Sprinkle the kanten or agar powder slowly into the juice with constant stirring until well incorporated. Check that there are not lumps of kanten or agar powder present. Weigh out the agar powder carefully as adding too much would cause the jelly to become rock hard while adding too little may make it difficult for it to set properly. Strain the mixture over a sieve into a saucepan. Heat the mixture over medium low heat until just below the boiling point. Stop when bubbles form around the perimeter of the pot without the mixture coming to a rolling boil yet. Carefully ladle the kanten jelly mixture into each cup until around 3/4 filled. Carefully skim off any foam on the surface and leave the kanten jelly cups to cool to room temperature before covering them with the peel “lids” and place into the refrigerator for at least 3 hours for the jelly to chill and set properly. When ready to serve, cut into wedges and serve cold. This entry was posted on May 8, 2014 by Alan (travellingfoodies). It was filed under Food, Simple Eats and was tagged with agar agar, citrus, haruka, hyuganatsu, Hyuganatsu Kanten Jelly, japanese, jelly, kanten, sugar, wagashi, 日向夏柑の寒天ゼリー, 日向夏柑，はるか, 日本. These look so sweet and pretty. 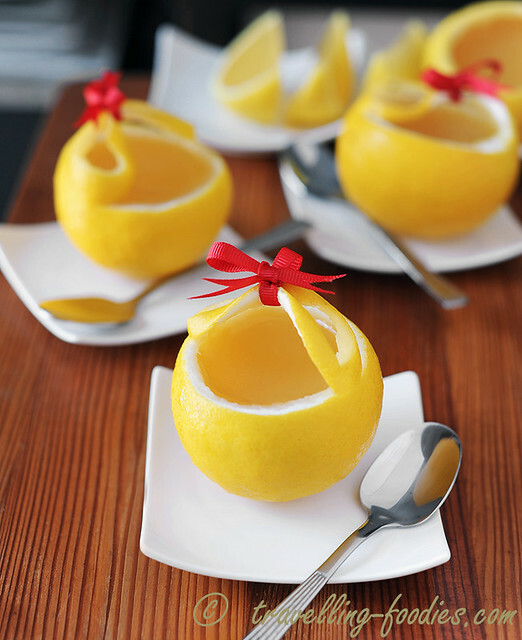 So cute and such a clever way to use the skin as a cup! So delicate and beautiful. Can’t bear to eat it.